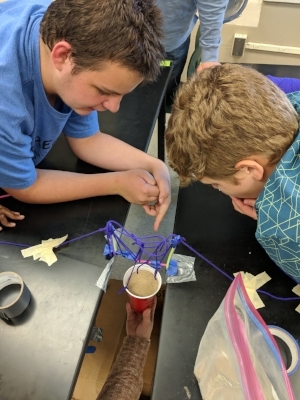 On October 9 and 11, the students at Brittany Woods Middle School and Holman Middle School were faced with the task of building a suspension bridge using only straw, string and some tape. After some time planning and crafting the design, the final contraption was put to test. A bucket was attached to the bridge spanning the gap between two tables and sand was gradually added to the bucket. Let’s see if the students succeeded in building a strong bridge! 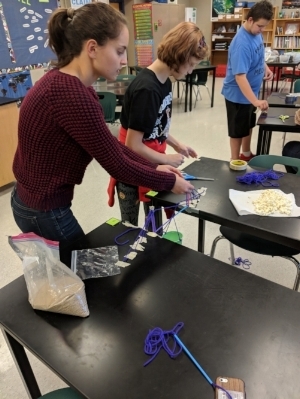 Grace accepted the challenge of building a suspension bridge to span a gap that was two straw lengths wide. Her design was so sturdy that it stayed up under the load of a full cup of sand despite its great length! This is Julia our volunteer collaborating with a student to build a bridge. Ms. Huttie popped popcorn for the whole group as well! Two Holman Middle School students observe how much sand their bridge will hold. Brittany Woods Middle School students adding final touches to their bridge! 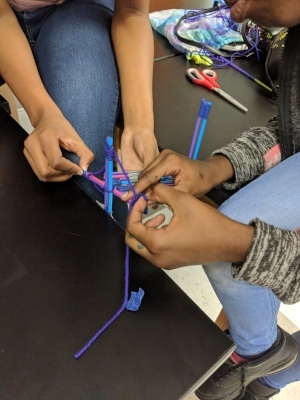 This is Korion and Tamera collaborating at Brittany Woods to build a suspension bridge using only straw, string and some tape. They were successful in holding up an entire up of sand with only two straws spanning the gap between tables.